How We Became To Be - Art is everything. When I was a little girl, I lived in moments. I did not live for moments or for the weekend, I truly lived in the moment. My favorite book was (and is) “Harold and The Purple Crayon.” I would check it out over and over and over from the library. 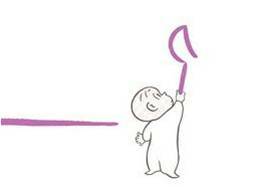 I loved how Harold created whatever he needed with his purple crayon and his image would come to life. I couldn’t believe it but at the same time believed it. I believed in its magic. Harold taught me so many things...but most importantly he taught me to be curious, to create what I need and to live in the moment. I would play outside and dance in the leaves. I would go sledding and come inside and drink hot chocolate and watch Planet of the Apes (classic tv). I would pick dandelions and make a wish with each pull. I watched ants crawl all over the beautiful peonies that lined our long driveway. I built a fort out of snow once and was so comfortable that I fell asleep inside the fort and almost got frostbite but it didn’t bother me…I loved being outside in the stillness of the snow. I lived in the moment. It was beautiful. One of my favorite things to do was make art and create. My life was endless creative expression and was pure bliss. Fast forward 20 years and I am filling out an application to take the MCAT, otherwise known as the Medical College Admission Test. My whole life was school and studying...I didn’t love it. I wasn’t living in the moment, I was living for moments. I wasn’t happy. I woke up to my life when I was filling out the application and questioned everything I was doing. How was it that I was applying for medical schools and yet so unhappy? Why didn’t Biology fill me up? Why did I feel so lost and empty? I had been working all of my life for that moment and should have been celebrating, instead I was lost, alone, defeated and depressed. At that point, I decided to bring fun back into my life. I went to a local grocery store and purchased a $.99 set of watercolors and a $2 sketchpad. I brought them back to my apartment and began to paint. I was scared to begin making art, I thought I wasn’t an artist, I thought my artwork wasn’t good enough and I had no idea what I was doing…but I did it anyways. Despite it all, I did it anyways. I created painting after painting and began giving them away as gifts. I also decided to finish my biology degree just for fun and tack on a second degree in psychology. Making art connected me to the beauty of the moment, it connected me to love and flow, it connected me to myself and my soul- it connected me to my light and the light of my heart. The $.99 set watercolors led me to question just how was it that making art made me feel so good, how was it that time stood still when I created and I felt so filled up and complete after. I didn’t understand it but wanted to understand; I started doing research on psychology and art and discovered there was a whole field called Art Therapy. I could not believe it, my two loves, together. The first book I stumbled upon was a book by Pat Allen called ‘Art IS A Way of Knowing,’ I read it all in one sitting. I could not put it down. I knew from that moment that my calling was to be an art therapist. I knew it in every part of me and deep down in my heart and soul that I was called to do this work. I went on to become an art therapist and learned that art therapy is a form of expressive therapy that uses master-level art therapists and the creative process of art making to holistically make changes to the mind, heart, body and soul that foster growth, healing, mindfulness, connections, or whatever you may need in that moment of time. I worked in a variety of settings, everything from relational trauma to an inpatient psychiatric hospital to working with cancer patients and I never quite felt home. Each job was amazing but I knew that each was temporary for me and that I was working towards something…I didn’t know what at the time but kept putting one foot in front of the other and kept moving and learning. their young lives. It was my job to create art with the children...and so I did. The children arrived defeated, looking at their feet and not excited about being at the camp and by the end of two weeks, they left singing, smiling, dancing and had a sparkle in their eyes- they left living in the moment and connected to their light...the light that rests deep inside of their heart…the light that rests deep inside all of our hearts. It is such a powerful and beautiful light that it can sometimes get blocked with all of the struggles and hardships we endure…life is hard, there is no doubt about it and no one is immune to pain and suffering but life is also BEAUTIFUL. Wherever there is darkness, there is light- always, sometimes the light is so dim that we can't even see it but it is there waiting patiently for us to return. It will never leave us. Engaging in the creative process of art making slowly erodes the barriers that we can build around our hearts that block us from fully living; eroding these barriers allows for light to shine from our heart and to enter our heart. The light of the children’s hearts were ignited with art therapy. It was more than a gift, it was everything. The Light of The Heart was born on the east-side of Aurora working with those amazing children; I will never forget those children- ever. I am grateful for them; they changed my life and brought words to my life mission. It is my life mission to connect people with the light of their hearts through art therapy and so The Light of The Heart’s mission became to provide a safe and encouraging environment for individuals to uncover the light of their hearts through the creative process of art making. Our vision is to create a community that embraces and utilizes the creative process of art making to allow for the light of all of our hearts to shine bright, building a safer, connected and more supportive community for all to heal, grow, prosper and love. And that is just what we are going to do…. The first program we are beginning in Aurora is our mobile art therapy program, an innovative and pioneering program that will connect our community through art therapy and provide art therapy for those that have no access to art therapy in Aurora. We wll be traveling around Aurora to provide art therapy onsite at our partner organizations. It is our goal to enter multi-year partnerships that will gradually allow for the program to become self-sustaining and a staple program in our community. It is an honor and a privilege to do this work; we are blessed to be agents of social change in our community and look forward to creating with you... to providing a safe and encouraging environment for you to connect with your light through the creative process of art making and to connecting our entire community through the light of the heart. I do believe that art and love can change the world.